Scott's Web Log: Book Review: "Invisible Frontiers: The Race to Synthesize A Human Gene"
Book Review: "Invisible Frontiers: The Race to Synthesize A Human Gene"
A True Story of Oversized Egos, Incredible Greed ... and Insulin! Its been a while since I last did a book review, in part, because of the holidays and the time it took me to finally sit down and read a book. 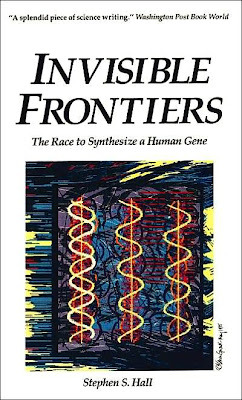 My review is on the 1987 book "Invisible Frontiers: The Race to Synthesize a Human Gene" by Stephen S. Hall. Although it took me a while to get around to reading it, this now out-of-publication book is one I highly recommend checking out at your local library if you're so inclined, or you can find it used at online bookstores, too. Just what is Invisible Frontiers all about? Not really a topic I expected to find terribly interesting reading, but the story turned out to be one of the most interesting stories which just happened to chronicle the development of synthetic "human" insulin back in the late 1970's to the early 1980's. In retrospect, it seems only fitting that this true story occurred at the very beginning of the Reagan Era, as the prevailing attitudes of the time produced the hit television show Dynasty, gave birth to Madonna as "the Material Girl" and, of course, characters from the movie Wall Street like the villainous Gordon Gekko who proclaimed "Greed is good" seemed to define that era. But what is most interesting is that those attitudes evidently infected the normally conservative and upstanding world of science, too. My reason for reviewing this book now, aside from the fact that I just finished it, is because the end of the month (on January 28) will mark the 21st anniversary of the day Genentech was incorporated as a Delaware corporation. It was indeed interesting to examine that company's role was in diabetes care and treatment, and let's just say, the genuine facts are far more interesting than what I've read in the press or from PR departments! First, some background. A few weeks ago (January 18, 2008, to be exact), I bookmarked an interesting post from Dr. Bill Quick's SharePosts at MyDiabetesCentral.com. 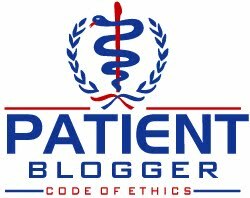 Some of you may be familiar with another diabetes authority, David Mendosa, who also posts regularly at the same website. Dr. Quick's post was entitled "Where did beef and pork go?" and Dr. Quick mentioned that he had received an e-mail inquiring about the insulin which served millions of patients quite well for over 75 years. Dr. Quick appropriately referred the patient to the U.K.'s Insulin Dependent Diabetes Trust for more information on the subject, which was indeed an excellent recommendation. But Dr. Quick also pointed out "The writer has some good questions, but sadly, has some misinformation mixed in." Dr. Quick noted that some heart medications had been discontinued, but I feel compelled to respond because Dr. Quick also has some misinformation in his own response to the patient's question, perhaps because he has bought into the pitch from the proponents of biotechnology hook, line and sinker? I cannot comment on that. But Dr. Quick wrote "To get back to insulin: why did pork and beef insulin disappear? Two reasons that I'm aware of: purity, and production cost." He later adds "And it's my understanding that the production costs for extracting animal-sourced insulin were rising, as the production costs for making semisynthetic human insulin have fallen, so economically, it's cheaper to make insulin by semisynthetic methods." I should also note that insulin made by recombinant DNA is not semisynthetic, it is purely, 100% synthetic. The insulin you buy from your local pharmacy in the U.S. has never seen a pancreatic beta cell before. And while it may have been just like someone's human body once produced, it is not necessarily just like my or your human body once made, as the manufacturers do not use my personal DNA (or yours) in its production. Anyway, while these reasons certainly sound logical, indeed after 26 years or so, that's what the manufacturers and their sales reps have been drilling into the heads of doctors about their genetically-engineered synthetic insulin for decades now. The only problem is one I have noted before: it is very selective disclosure of the truth, in effect misrepresenting that data to present the truth in a way that benefits one party more than the other. They aren't exactly lying about the purity, but they are making it sound like the old stuff was completely full of garbage, which wasn't the case at all. Dr. Quick is right when he notes that the source for beef and pork insulin products were extracted from pancreases from cows and pigs used in meat production, but to state that the insulin that was made in that manner was somehow "impure" is categorically false, at least by the time synthetic insulin was introduced. A friend of mine has noted that the introduction of chromatographic gels and high-pressure liquid chromatography (HPLC) equipment saw "pure" insulin undergo even more purification, so that by the late 1970's insulin marketers could display "highly purified" on their products without invoking any claims of false labeling. As a matter of fact, purified animal insulins ultimately achieved a purity rate of 99%. Ironically, even with the use of today’s HPLC techniques, synthetic "human" insulin can only advertise a purity measure of 97%! Also, in respect of their influence on insulin pharmacokinetics, moderate concentrations of certain insulin antibodies may, in fact, be of positive advantage to all diabetics without endogenous insulin secretion (e.g. people with type 1 diabetes) because insulin binding antibodies effectively increase the insulin's clearance rate and distribution space and therefore help to prolong its pharmacological and biological half lives. [Gray RS, Cowan P, et al., Influence of insulin antibodies on pharmacokinetics and bioavailability of recombinant human and highly purified beef insulins in insulin dependent diabetics. Br Med J (Clin Res Ed). 1985 Jun 8;290(6483):1687-91. See also here] Dr. Quick is right that the level of purity increased steadily over the years, but putting things in perspective, it should be noted that by the late 1970's, pork insulin being sold was 99% pure, and therefore was no less "pure" than today's synthetic insulin. Dennis Kleid [one of Genentech's founder's] vividly recalls the moment when some long-cherished conceits about the uniqueness of genetically engineered insulin began to crumble in his own mind. It came during a trip to Indianapolis in December 1979, when the seasoned hands at Eli Lilly and Company showed the visiting upstart cloners through the insulin plant and explained to them how insulin was prepared the old-fashioned way. "We were under the impression that it was impure and there was crap in it and stuff like that," Kleid remembers. "But that stuff was crystallized two times in the process. It was incredibly pure stuff. And there were only a few parts per million of contaminants. That was a real eye-opener. They were not making crap. Maybe they used to. But they certainly, in the last few years were not making it. And they impressed upon us very, very clearly that this [human insulin] was going to be no advantage at all." The newer way of making porcine insulin did not prompt allergic reactions, the biologists were told, and Lilly had enough glands to last for a long time. As the tour of the facilities continued, the complicated economics of insulin production became clear as well. The Genentech scientists viewed a vault filled with vials of insulin. They were shown a freight car full of frozen pancreases, fresh from the stockyards, 25 cents per gland, shipped by the ton. They were shown where the glands were ground up prior to the extraction and purification of insulin. The recombinant DNA alternative was elegant and less messy, but not necessarily simpler and, more important, not necessarily cheaper, despite all the persistent suggestions, dating back to the ferocious public debates on recombinant DNA, that it might be. Hmmmm, so there we have an admission from one of Genentech's founders that he himself was sorely mistaken about the quality of animal insulin sold by the early 1980's, and on top of that, he also notes that the process they had developed was not necessarily any cheaper. More on the cost issue in a minute. It's worth acknowledging that some people did have allergies to animal insulin. Some have estimated that may have been as much as 10%, largely with beef insulin, which differs from human by just 3 amino acids (not dramatically different in that it has a comparable number of "different" amino acids that Lantus, Novolog/Novorapid, Levemir or Apidra have from human insulin). And before you reach the conclusion about how much better the new stuff is, you should also know that it is seldom disclosed that some 4% of people with type 1 diabetes also experience severe allergic reactions to synthetic "human" insulin, a severe form of lipodystrophy even though they do not have physical manifestations of the metabolic syndrome or lipodystrophy. Others have routinely complained about problems related to hypoglycemia unawareness with the synthetic insulin, which was actually scientifically validated in the early trials undertaken by Lilly in Germany, but somehow never managed to warrant further investigation by regulators. "No," replied Levine, "that hasn't turned out to be the case yet." At that point, perhaps the only major difference between human insulin by recombinant DNA and purified pork preparations was price: the porcine insulin cost less than Humulin. Recently [circa 1987], the price differential has vanished, according to diabetologist Dr. Jay Skyler, "and purified pork is essentially dead as a product." Finally, has human insulin alleviated the problem of supply? "Well," Levine answered, "we haven't reached the stage where it needs alleviation. But one can never tell." The jury is still out, however, on any advantages of human insulin over purified pork preparations. Dr. Mayer Davidson, director of the Diabetes Center at Cedars-Sinai Medical Center in Los Angeles, reflects a general sentiment among clinicians when he says, "So far, I don't think it's been a big breakthrough." Dr. Andrew Drexler, of New York University Medical Center agrees, saying, "As a general phenomenon, we all see it as a minor, incremental improvement." Although not mentioned by Dr. Quick in his post, another element that is frequently mentioned about that time was that the rush to create insulin via recombinant DNA technology was driven by a looming shortage of animal pancreases. Supposedly, people weren't eating as much meat, which meant fewer pancreases, therefore the supply was going to run out. In the early 1970's we began to be concerned about a possible shortage of insulin. Until now, the world's insulin needs have been derived almost exclusively from pork and beef pancreas glands, which were collected as by-products from the meat industry. This supply changes with the demand for meat and is not responsive to the needs of the world's diabetics. Indeed, from 1970 to 1975, the supply of pancreas glands in the United States declined sharply (1) and remained on a plateau at that lower level in succeeding years. There is no accurate way to predict availability of future supplies of glands, although we predicted that the demand for insulin would continue to increase. Our concern was whether or not there would be a time when the supply of bovine and porcine pancreas glands might not be sufficient to meet the needs of insulin-dependent diabetics. (1) U.S. Department of Agriculture estimates, Livestock and Slaughter Reports (Bulletin of Statistics 522, Economic, Statistic and Cooperative Services, Washington, D.C., 1980). In the 1920s, there was no known way to produce insulin. The problem was solved, temporarily at least, when it was found that insulin from the pancreas of a pig could be used in humans. This method was the primary solution for diabetes until about six years ago. The problem with insulin production was raised again: There were not enough pigs to keep the supply of insulin intact. Scientists needed to devise another way. This is where one of the biggest breakthroughs in recombinant DNA technology happened. To hear some tell it, there was never a supply problem with pig pancreases in the first place. "The whole thing was rubbish," insists Paul Haycook, research director at Squibb-Novo. "There was never a shortage of pig pancreases, and there never will be." Haycook blames the scare on a miscalculation by an official who had prepared projections for the Food and Drug Administration - a mistake based, ironically, on a mistake in an Eli Lilly training brochure which confused kilograms with pounds. Instead of projecting an insulin shortage by 1982, a revised FDA report predicted adequate insulin supplies through the year 2006. In any event, there is never likely to be a shortage caused by a scarcity of pancreases. You can't make stuff like this up! In fact, by 1987, Genentech was earning $5 million in licensing fees from Lilly. And by then, Lilly had already spent $40 million to build a new plant in Indianapolis to make the stuff. There was no turning back. A sampling of initial reaction shows that Humulin was greeted more as a technological than a medical breakthrough, and that this sentiment was building even before the drug reached pharmacies. As early as 1980, the British magazine New Scientist reported, "Other big chemical manufacturers predict that Eli Lilly's massive $40 million investment in two plants to make insulin - may be a classic example of backing a loser." And the Economist [concluded]: "The first bug-built drug for human use may turn out to be a commercial flop. But the way has now been cleared-and remarkably quickly, too-for biotechnologists with interesting new products to clear the regulatory hurdles and run away with the prizes." So, there you have it. The real story, told in gory details in the book "Invisible Frontiers: The Race to Synthesize A Human Gene". It was all about a few scientists from UCSF who were competing with a handful of other scientists from Harvard and University of Chicago who were in a race to grab the gold and glory before others got to it. They didn't care about people with diabetes, rather, the diabetes population was just a tool used to secure their wealthy retirement. And the product of their labor did not improve the lives of people with diabetes, either. Some point to insulin analogs as an example of how genetic engineering has helped patients with diabetes, but as I noted in my 2007 Year-End Review, those don't deliver superior glycemic control yet they cost a lot more than regular insulin. I'll let you judge for yourselves, but lets just say this book was A True Story of Oversized Egos, Incredible Greed ... and Insulin! Thank you for this wonderful infusion of sunlight! Unfortunately, we are now saddled with a much more expensive product and one that is, for many, less effective and less safe. I love how these so-called scientists risked the lives, health and safety of diabetic children (and the adults they would eventually or hopefully mature into ) as a 'ready-made market for a product that is less safe and less stable than the old stuff. They could have used those great big scientific brains to help find a cure for us. Instead, they made money off the endless suffering that is Type 1 diabetes, its management and its complications. They wasted valuable money that might have gone towards real research into a real cure. All of them, including the founder of Genentech, should be lined up against a btick wall and shot for what they have done to us, our children and our health. Your posts are always detailed and informative. Which means I don't get here too often because it takes too long to read and digest the information. Thank you for the review of this book, I've just reserved a copy from the library. Am I right in thinking that beef and pork insulin also contains C-peptide? If so, that would be another strong reason for continuing it's manufacture and use. Scott - fascinating stuff here. I very much appreciate you sharing this with us. I'm a bit slow on the uptake with much of this, so your ability to break it down and present it to us in such a way that makes it relatively easy to catch is very, very helpful to me. Awesome review, Scott!! Scary, scandalous and sobering -- but downright awesome! I'm a strong believer in Karma. Karma will not manifest in the form of evil...but I think it lends a helping hand to those who muscle for good in the world. For insulin-dependent diabetes -- that might be a reversal of fortune and return to the market of *natural-sourced* insulins. What's the harm in choice?